Easy Roasted Sweet Potatoes are a simple side dish or base for other recipes. Leftovers keep well! Preheat the oven to 400F. If necessary, line the pan with parchment paper (see recipe note). 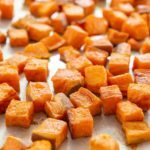 Decide whether or not you'd like to leave the skin on, then cut the sweet potatoes into cubes about 3/4" wide (see step-by-step photos for cutting guidance). Place the sweet potato cubes into a bowl and toss with the olive oil and salt. Spread them out on a sheet pan in a single layer, then roast for 40-45 minutes, giving everything a toss halfway through to redistribute, and keeping your eye on them at the end. They should be fork tender in the middle, with a slightly caramelized exterior. Enjoy! Parchment Paper note: depending on your oven and the brand of sheet pans you own, the sweet potatoes may be prone to burning. When I use air bake sheet pans, I have no problems with burning, but with regular uncoated pans, the sweet potatoes close to the edges of the pan can burn. Using parchment paper helps dramatically, so if in doubt, line your pan.